Kids love to spend time with their parents and copy the things that they do. This is especially the case when it comes to using tools and doing DIY jobs that need doing around the house. However, it can be dangerous for toddlers and children to actually get involved with helping you out. 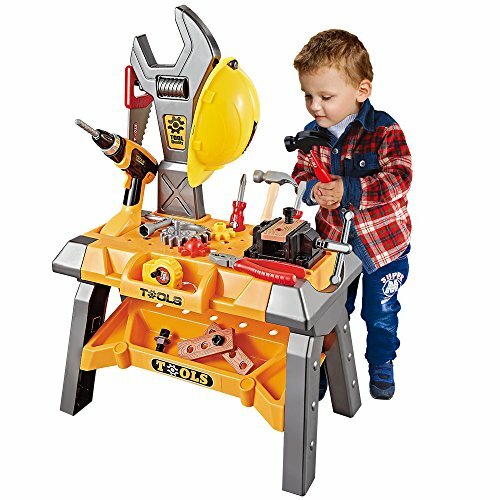 That’s why many brands have made some awesome workbench sets that allow children to feel like they’re alongside you while you work. 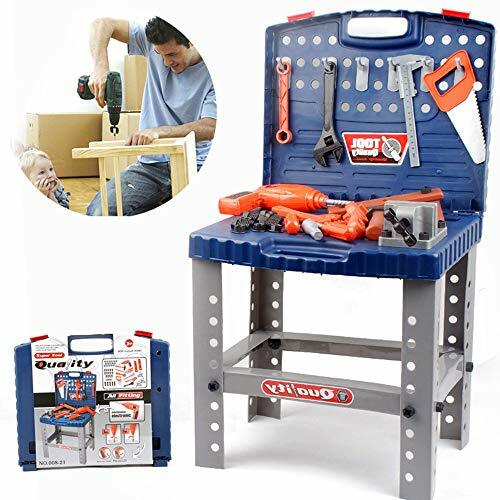 There are a range of different workbench sets available that are best for certain age ranges. If you wanted to learn more about these sets, take a look at our reviews below! With a range of 75 tools available, you can be sure that your little one is provided with plenty of parts to play with and remain busy for hours on end. We were also impressed with how they’ve been made with a realistic design. This allow kids to use them to play with more imagination. As a result, their creative thinking skills are able to improve. In addition to this, there are awesome light and sound effects available too. These are fantastic for improving your child’s visual and auditory learning senses. They also make the set more exciting to play with. Not to mention, the hands-on approach develops your child’s motor skills and hand-eye coordination. Kids have been loving the realistic design, as well as the light and sound effects as it makes the set incredibly exciting to play creatively with. 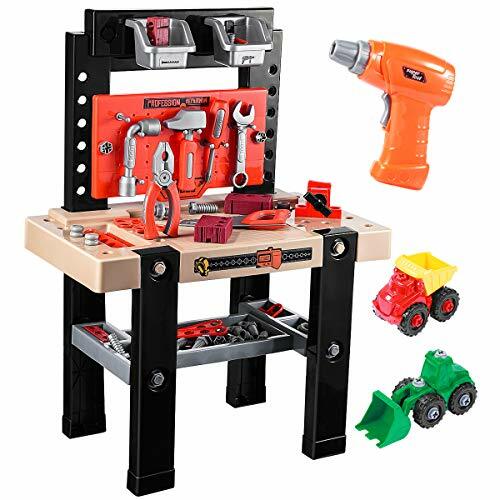 Children are provided with an impressive total of 120 parts to play with and stay occupied for hours on end while playing with this workbench tool set. We liked how it comes with a range of realistic features. For example, the electric toy drill has a rotating function that also makes sound effects. This makes the playing experience more interactive for children. It also helps them to play with more imagination. The sound effects are effective for improving your little one’s auditory learning senses too. In addition to this, children are able to work on their motor skills and hand-eye coordination while handling all the different tools. Toddlers and slightly older kids have been loving how they can use this set to role play and be creative as a result of the realistic design and sound effects. 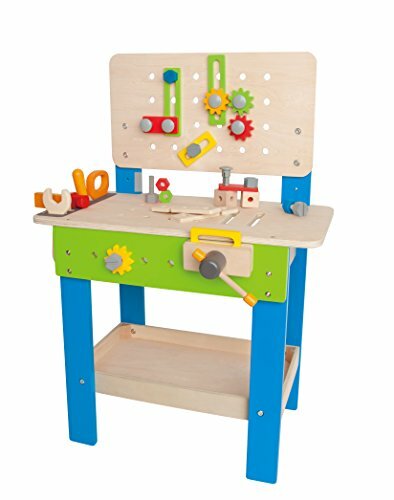 We liked how this workbench comes with a wide range of accessories for kids to play with as it can keep them entertained for hours on end. There is a toy hammer, drill, and much more available. They have designed these toy tools with realistic aspects which children have been loving. It enables your little one to use them to play in more imaginative ways, which is great for their creative thinking skills. Furthermore, since they’re holding onto the various tools and pretending to use them to build things, their motor skills and hand-eye coordination are able to develop. Parents have also been liking how there are no sharp edges to keep their kids safe. The realistic design allows kids to use this set to play for hours while having a blast and using their creative thinking skills. Kids have been having a lot of fun with this set because it comes with an battery powered drill that’s able to make realistic sounds. These sound effects make for a more immersive playing experience. Your little one is also able to use this realistic feature to play with more imagination as it feels more believable to them. We also liked how there’s a workbench light available overhead. This is a larger workbench which means that multiple kids can play with it together at the same time. As a result, your child’s social skills are provided with a great chance to improve. The larger workbench enables your child to play with others and be creative while improving their social skills. This is another larger workbench option which means that your little one is able to play with other children. Therefore, you can expect their social skills and ability to work in teams to improve. We liked how the electric drill that’s available has realistic features as it makes the playing experience more interactive. As a result, kids are able to use their creative thinking processes to play. In addition to this, there is a total of 76 pieces available. So, your child is provided with plenty of toys to stay occupied for a while. Using all of these tools is excellent for their motor skills and hand-eye coordination too. This is a fantastic set that lets kids play together and improve their social skills, while also developing their motor skills and coordination. 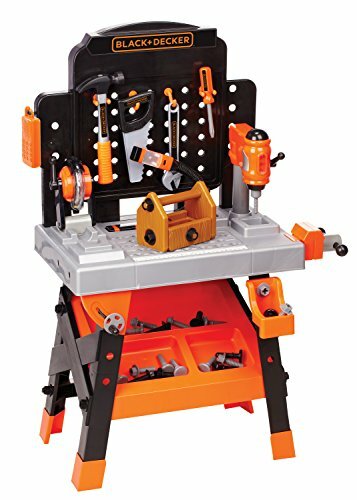 The drill that comes with this workshop set is electric and features realistic sound effects and comes with drill bits that can be swapped out. These are realistic aspects that allow kids to use more of their imagination while playing. We also liked how there’s a pretend vice available that functions like a real one. In addition to this, there’s plenty of room for the 65 pieces that are available due to the pull out drawers and shelves available. 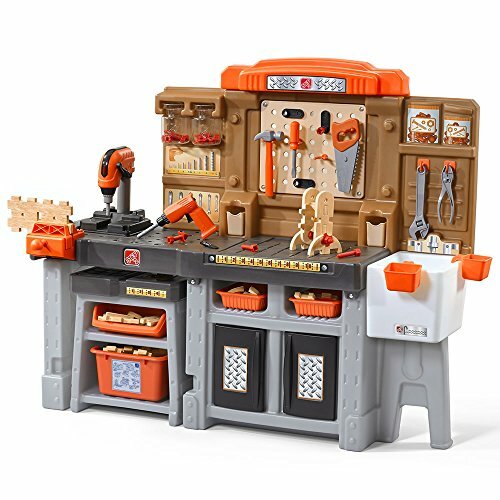 The set includes a wide variety of pretend tools that include a hammer, drill, saw, and toy pieces of wood. While kids are using these pretend tools, their motor skills and hand-eye coordination are able to develop. The realistic features and wide range of pretend tools available ensure that kids are able to play creatively for hours while improving their coordination and motor skills. With 120 pieces available in this set, you can be sure that your little one can keep themselves entertained for hours. It includes things like an electric toy drill, a hammer, and much more. We were impressed with how the drill functions just like a real one by rotating and making sound effects. These realistic features are super interactive for kids and encourage them to play with more creativity. While playing with this set, you can expect your child’s motor skills and hand-eye coordination to develop well. This is because it involves such a hands-on approach to playing. The realistic design features and sheer number of pieces available in this set means that your child can play imaginatively for hours on end. 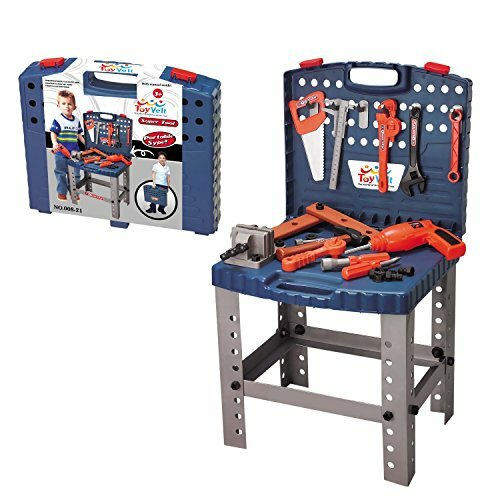 This workbench comes with a total of 32 pieces that includes a pretend saw, wrench, hammer, screwdriver, bolts, a vice, and more! So, your little one is provided with plenty to stay occupied for a long time. We liked how this set provides children with a fantastic opportunity to work on their creative thinking processes. This is because they’re able to copy how they may have seen their parents using similar tools around the house. Since the set involves such a hands-on experience, you can also be sure that your little one’s motor skills and hand-eye coordination will be able to develop incredibly well. Parents have also been glad to find that there are shelves to make storing the parts away easier. Kids have been having a blast being able to use this set to play creatively while also improving their motor skills and coordination. 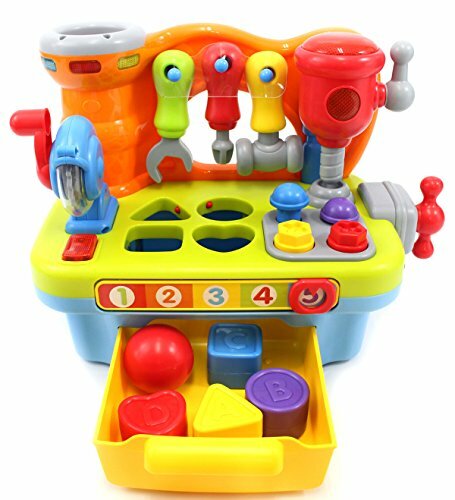 If you’re looking for a workbench set for your toddler, this PowerTRC one would be a fantastic option. This is because it manages to help your child learn more while also having fun singing. We liked how it features 7 songs for kids to sing-along with. There is also a range of sound effects which are great for improving your little one’s auditory learning senses. Toddlers have also been loving the flashing lights that are available. In addition to this, there’s a game that involves matching shapes, as well as games that help kids to improve their color recognition skills. Not to mention, 7 toy tools are available for toddlers to play creatively with too. This is an awesome option for toddlers because it gets them more familiar with colors and shapes, while letting them play creatively at the same time. We were impressed with how there’s a toy vice with this handyman bench that functions just like a real one. This lets kids put things inside it to keep them steady while they pretend to get to work! With an electronic toy drill available, kids are able to play with plenty of imagination since it makes a range of sound effects. This makes the playing experience a lot more realistic for kids. 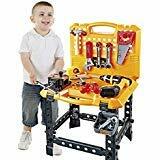 This workbench is also pretty large which means that your child can play along with other kids. As a result, your little one’s social skills and ability to work in teams is able to improve. We liked how kids are able to gather around this workbench to play creatively together and improve their social skills. This set comes with a range of 50 pieces which keeps kids occupied for hours on end. It includes a range of nuts and screws, as well as a toy hammer, drill, wrench, screwdriver, and more! While kids are using the various tools available, their motor skills and hand-eye coordination are provided with a fantastic opportunity to develop well. The toy tools have also been made with a realistic design. As a result, your little one is able to use them to play with a ton of creativity. In addition to this, parents have been liking how there are drawers and cabinets available as they make storing all the parts away a breeze. Kids have been having an absolute blast playing with this set and being able to improve their motor skills and coordination while being creative. With more than 135 pieces available, you can feel confident in knowing that this set comes with plenty to keep your little one entertained for hours. It includes bolts, nuts, toy spanners, a screwdriver, spanner, drill, and more. We were impressed with how there is a number of realistic sound effects available with this set. This is because it makes the playing experience more real for kids and they’re able to play with a lot of creativity as a result. This is also a large workbench, which means that your child can have their friends come over and play. Therefore, your child’s social skills and ability to work well in teams is able to improve greatly. The larger design of this workbench allows kids to play together and work on their social skills, while having fun and being imaginative. Parents have been surprised to find that this workbench can be easily portable. As a result, you’re able to pack it up and have it set up for your child while you’re on the go to keep them occupied. It comes with a wide variety of tools that have been made with a realistic design. This allows kids to use them more imaginatively in their role play games as they can copy what they’ve seen their parents doing. This is awesome for their creative thinking skills. While kids are handling the various toy tools, their hand-eye coordination and motor skills are able to develop well. There are also sound effects that are exciting and can improve their auditory learning senses. If you’re looking for a workbench that you can take with you while traveling, this one is a fantastic choice! It will keep your little one entertained for hours while you’re on the go! This is an awesome workbench that allows children to build up to 3 vehicles. They’re able to use the instructions and all of the pieces to make these vehicles – alternatively, they could also choose to make their own! This provides your little one with an excellent opportunity to let their creative side flourish. 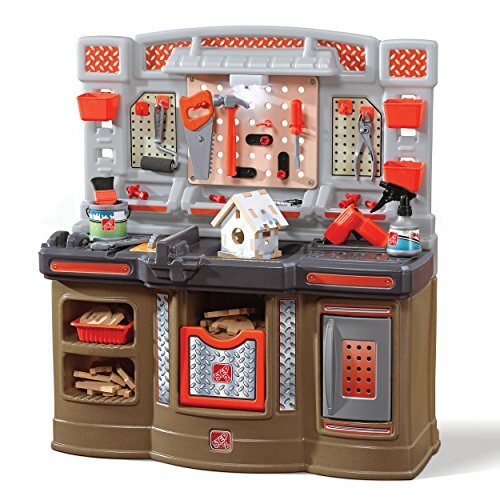 The set comes with a toy hammer, wrench, screwdriver, tape measure, and more to keep kids engaged for hours. While using all of the tools and accessories available, children are able to develop their motor skills and hand-eye coordination. We also liked how there are sound effects available as they make for a more immersive playing experience. We liked how this set lets kids build 3 vehicle toys or create their very own. During the process, their coordination and motor skills are able to improve. 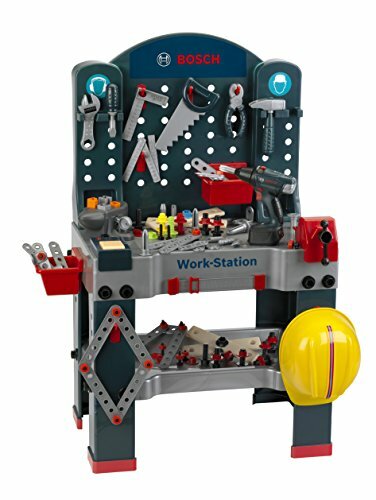 This is an excellent workbench set that you can rely on to keep your child entertained for hours, while also helping them to work on key developmental areas. 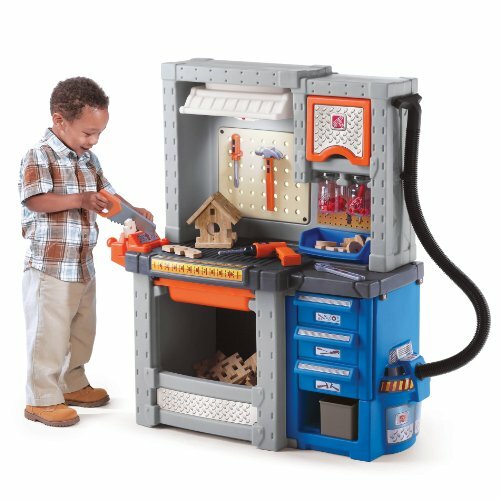 It comes with 68 play tools and accessories that include a drill, nuts, bolts, a hammer, and more! While using all of these parts, your little one is able to develop their motor skills and hand-eye coordination. This is a result of the hands-on approach to playing. Furthermore, the parts have a realistic design. Therefore, the playing experience is a lot more immersive for children, which inspires them to play with more imagination. In addition to this, you can easily make this workbench compact to take it around with you. If you’ve been searching for a workbench that’s easily portable, this would be a great option. It also develops your child’s motor skills and hand-eye coordination. We liked how this set includes a range of toy tools that have been made with a realistic design. This is because it makes the playing experience more realistic for kids which helps them to be more creative. 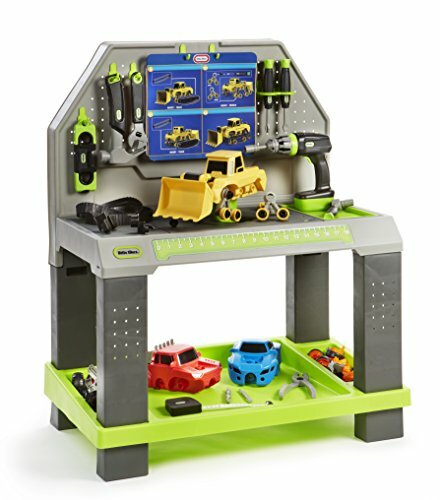 In addition to this, there are toy vehicles available that can be assembled and taken apart by using the nuts, bolts, and screwdriver that are included. This is a fun process that develops your little one’s motor skills and hand-eye coordination. Parents have also been glad to find that this set is safe for their little one to play with. As a result, we recommend it as being a great option that allows toddlers to play for hours while remaining safe. The realistic design available with these toy tools encourages toddlers to use them to play in more creative ways for hours on end. With 88 pieces available, you can be sure that your little one is provided with plenty of parts to keep themselves occupied for hours. It includes a toy wrench, screwdriver, hammer, bolts, and more. We liked how these parts have been made with a realistic design. It makes the playing experience feel more reals for kids which is an awesome way to encourage them to be more imaginative. In addition to this, handling the different tools and accessories is an effective way to develop your child’s motor skills and hand-eye coordination. All of the materials used are also free from toxins to ensure your child’s safety. Due to the realistic features, kids are able to have a blast playing creatively with this set for hours on end. Their motor skills and hand-eye coordination are also able to improve. 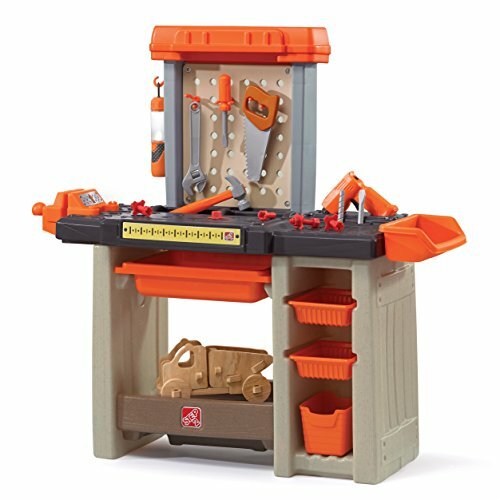 Now that you have a better idea of the kinds of workbenches that are available for toddlers and kids, you can begin to narrow down your search to the ones that you think they’ll enjoy the most. If you’re not feeling completely confident on which one to pick, don’t worry. We’ve created this buyers guide section to provide you with some additional information that will help you to find the perfect one for your child. When it comes to toy tool benches that are for toddlers and older kids, there are some key differences that you should take note of. 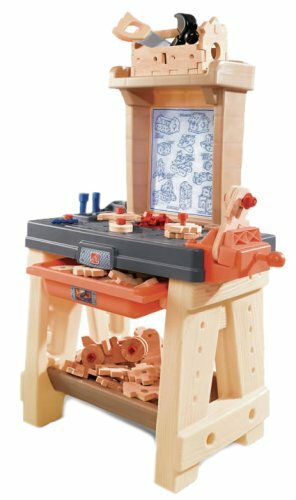 The toddler workbench sets often include parts that have been made with plastic materials. This is to ensure that they are safe for your little one to play with. Furthermore, many of these sets tend to include more light and sound effects. These features work effectively to keep toddlers more engaged as they find these light and sound effects more exciting. They are also excellent for improving your child’s auditory and visual learning senses. The older children’s workbench options that have been mentioned in our review tend to be made with a more realistic design. This is because older kids prefer to be able to imitate how they’ve seen their parents use the same tools on their projects around the house. As a result, they feel more encouraged to use them to play with more imagination. Workbench toys for toddlers and older children do also have some similar benefits too. They are both excellent for developing your child’s motor skills and hand-eye coordination. If they’re larger in size, they can also be a lot of fun for kids to play in groups and improve their social skills. While reading through our review, and doing some of your own research, you will have likely seen some of the same brands come up time and time again. If you were interested to learn more about what makes these brands so popular, take a look below. Black and Decker is a fantastic company which you may recognize for their real tools. However, they also have an excellent range of toy tools for children. They understand that kids watch how their parents are doing DIY jobs and want to be involved. But this, of course, could be dangerous. Therefore, they decided to manufacture a toy range. So, your little one can pretend to be involved in different projects with you by using their imaginative thinking processes. PowerTRC is a relatively new brand that was established in 2014 and they have been completely focused on making high-quality toys for children. They have a wide selection of toys available in their range to ensure that parents are easily able to find something that their kids can enjoy playing with for hours. Step2 is an awesome company that has been committed to helping children make progress with different developments, while also being able to have a ton of fun. Therefore, your child can play with Step2’s toys and make various developments and have their creative thinking processes stimulated at the same time. They are one of the largest manufacturers of toys for toddlers and preschoolers in the U.S. Therefore, you can feel confident in knowing that they put out high-quality toys that children have been loving. Little Tikes is another brand that many parents have come to trust over the years. They put an emphasis on making toys for toddlers and children that encourage them to be adventurous and use their creative thinking skills more often. They’ve been in the business for 50 years, and over that time, they have gained some incredibly valuable insights into how to make toys that enable kids to have an absolute blast and be imaginative. There are a few different types of toy benches available and it’s a good idea to become familiar with what they are. It can help you to be sure to pick the one that’s best for your child. There are a number of great wooden workbenches available that kids really enjoy playing with. Their designs are usually pretty sturdy, which ensures that your little one is able to play with it for years to come. Wooden materials are often used for the options that are meant for older kids rather than toddlers. These ones also tend to be larger in size since the wooden materials are stronger. Plastic workbenches can be great for younger kids as they don’t have any corners to them. They are also usually a little smaller than the wooden ones, which can make it more manageable for toddlers to play with. 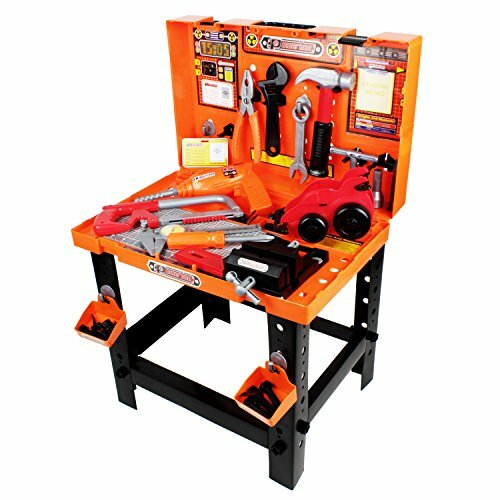 So, that wraps up our review on the top kids tool benches that are currently available. Make sure that you read through the main features, pros, cons, age recommendations, and what makes each one stand out. Our buyers guide also includes additional information that can help you to learn more about how to go about picking a workbench for your child. Hopefully, all the details in our review has provided you with everything you need to feel awesome about making a final decision.